Bayou City gets its nickname from the natural drainage system that courses through Harris County, but that network doesn’t always perform as advertised. The sewer lines that run under neighborhoods and commercial districts don’t have easy jobs either, so home and business owners count on Accurate Leak and Line to keep things running with expert Houston sewer repair services. Solving a sewer line repair problem involves identifying the cause and determining its exact location. Pipes are buried at varying depths under backyards and parking lots, and they can be cracked, buckled or choked with roots. Our licensed technicians use industry-proven equipment and technologies to precisely determine what kind of damage needs to be addressed. We combine real-time video inspections with static leak and hydrostatic pressure testing to complete our diagnostic process, and we use those results to develop a plan tailored to your project. Property owners usually assume that sewer pipe repair means major excavation, and some jobs require traditional trenching techniques. Once we’ve identified the problem, we work out site-specific plans that often offer less-invasive solutions. Our teams handle large-scale excavation inside the Loop and outside the Beltway, and we also excel at trenchless alternatives. Our CIPP process rehabilitates sewer pipes with epoxy lining that restores systems in a matter of days. Whether you need routine maintenance, drain cleaning, one-time repair or complete pipe replacement, we customize our solutions to your project. Because we’ve served home and business owners here on the Gulf Coast for more than 10 years, we understand the unique problems that make area sewer repair challenging. Our OSHA certified teams tackle every job with the very latest technology, so you can depend on us to apply best-practice sanitary precautions to all restoration processes. Our techniques often reduce project time to a matter of days, and that makes a significant difference in final job cost. We take professional pride in providing the best customer care in the area with expert services that respect your budget, schedule and landscape. We’ve been solving plumbing problems here in H-Town since 2002, and we’re proud of our solid reputation with both residential and commercial property owners. 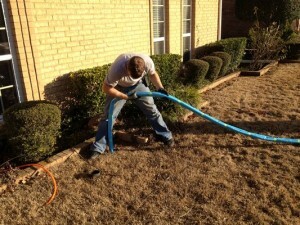 Whether it’s trouble in the backyard or under a corporate campus, Accurate Leak and Line handles Houston sewer repair and replacement all across the Houston area. We know how to keep things running, so CLICK HERE or give us a call today.